Migratory birds, songbirds in particular, over-winter in the tropics. Much of the land is being deforested to make room for agriculture. I have a unique opportunity to establish a bird sanctuary on at least 300 acres of a large organic cocoa plantation in the Dominican Republic. Funds raised for this project will be used to support a team of ornithologists who will identify the species of songbirds that live on the plantation. Migratory birds that spend spring and summer in the Northeastern United States breed and raise their young, then most fly south to spend winters in the tropics. Habitat loss and other factors are taking toll on bird populations. Most impacts appear to be due to deforestation in the tropics, as large tracts of forest are cleared to be replaced by pastureland for grazing cattle. The island of Hispaniola, shared between the Dominican Republic (DR) and Haiti, is ranked highest for biological importance in a worldwide assessment of bird protection priorities. However, Haiti has only 1.5% forest cover remaining, and the DR has about 10% (vtecostudies.org). The Dominican Republic was named by the United Nations as the country most likely to become deforested. The Dominican Republic has been identified as the country most likely to undergo deforestation. It is home to the last extensive forests of the island of Hispaniola, but much of the land is under pressure to be cleared. This project will serve two purposes: primarily to identify the bird species present at this location, and secondly, the eventual establishment of a bird sanctuary will preserve the habitat and will serve as an education tool for school students and local landowners. If you enjoy hearing and seeing songbirds and appreciate them as part of our local heritage, you can understand how important this piece of the puzzle is. Remember too, the benefit to our own habitat by the insect eaters that consume billions of insects! 1. To transport, house, and feed the research team in the Guananico area of the Dominican Republic. 2. The researchers will conduct an in-depth study of bird species present, primarily on the targeted 300+ acres and if time allows, on the remaining 990 acres of the plantation. 3. The inventory will produce a list which will then be used to determine the viability of establishing a bird sanctuary at the location. The owners of the plantation would like this project to take place as soon as possible, which means when the migratory birds return to the DR, this coming November/December. In order to entice researchers to take part in this project, I need to cover at least their ground and lodging costs. I will also pay a stipend to the Dominican birders taking part. Their presence is essential and I cannot ask them to participate for free. I have no funding sources available at this point. If I cannot come up with the funding, we cannot proceed. Growing up on a farm, wading in streams and playing in the woods made me a biologist, so it was natural for me to pursue that field in college, concentrating on endangered species and ecosystems. I am currently employed in Land Management but also monitor a nesting pair of bald eagles at a construction site. 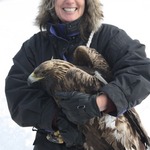 In addition, I am involved in an on-going golden eagle research project that is studying over-wintering populations of goldens in New York State. Seeing the changes in our ecosystems, not usually for the better, has made me sensitive to issues such as deforestation and the multiple impacts it brings. In the Dominican Republic, I have seen first hand the changes brought to previously lush valleys which have been cleared for pasture and thus, made sterile to birds and other wildlife. An island is a critical place to lose any habitat or diversity; an opportunity to preserve it is a golden moment.